At least it is warm. Imagine if the winds were 1-5 degrees Celsius! Then again I guess they would not be so fast if they were... In Scotland we occasionally have quite strong winds (nowhere near as strong I admit) however they always blow in cold air, often from near the artic around the winter. Seeing how there can be server problems for weeks before people notice, even if the storm knocked out the servers no one would have considered it being the cause and they could have been fixed before questions were raised. We are just that kind of undemanding community lol. Now that you mentioned it we will be sure to blame every single little problem on that storm, even those that clearly have little to do with it! Anyway I hope everything goes well for you and the storm does not affect you much where you are. Even if it would be for the better, that would have been for the wrong reasons. First, a quick update: Hurricane Irma is quickly fizzling out, and my city will be spared to the point where I'm not sure it will even rain here. The servers in Atlanta, GA will be perfectly fine. I must disagree with this assertion. This is Texas, with arrows pointing to ① the general area that Hurricane Harvey came ashore and impacted with high winds, adn ② Houston, the general area in Texas that received record-breaking rainfall and flooding. 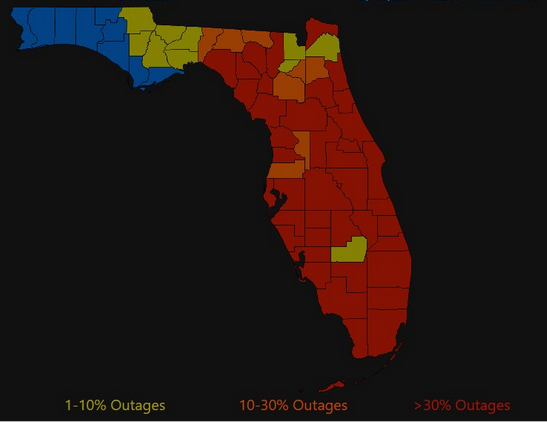 You can see which counties in Florida are affected by power outages as a proxy for storm effects. 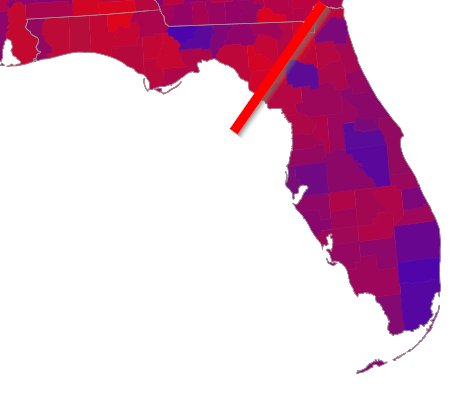 With the exception of Tallahassee, every Democrat-leaning city in Florida was affected. 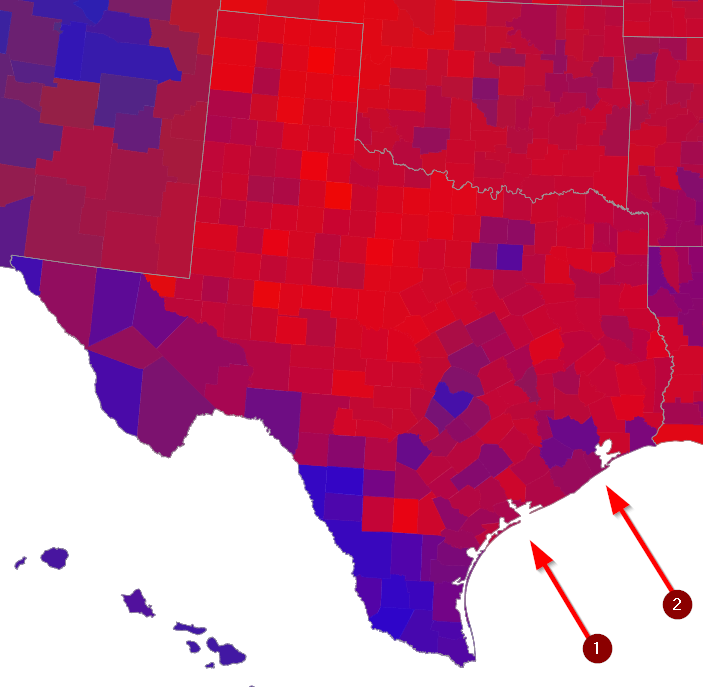 Basically, while there are Trump supporters that experienced both of these hurricanes, it was hardly exclusive; and in fact, some Democrat-leaning areas were most definitely hit. These were most certainly not disasters striking Trump supporters primarily. Except the USA electoral college system means that all (almost, Texas seemed to have 2 rouge votes, one different Republican and the other Libertarian?) the votes from the state counted towards Trump. Florida and Texas alone made up 65 votes for him, or 21.4% of his total vote. Sure the areas themselves may not have voted that way personally, but they still ended up technically voting for him (or one can consider it as their votes for Hillary having 0 weight). Personally I think international news if focusing too much on Florida. They had reporters standing in the open waiting for the storm to hit while many islands were being utterly destroyed by the storm were getting no live reported coverage at all. No doubt Florida will be/is/was badly hit, however some of the islands were hit a lot worse with many having near total destruction of all habitation on them. By the time it hit Florida the storm was downgraded from 4 to 3 and now 2. It is also worth noting that the reason some of the power outages are so bad is due to a combination of the size of the USA resulting in uniform remoteness and old or cheap power infrastructure. Many places in Europe could withstand such weather with considerably less power down time as the infrastructure would remain largely intact next to small or temporary faults. Enjoy the Brexit you supported. One cannot compare the two situations. Brexit referendum won by more people voting for it than against, true democracy as the people choose the outcome even if it is not what you voted for or had any idea what they voted for. Trump won by a land slide by less people voting for him than for Hilary, the US electoral college system. A comparable situation would be if the UK was to remain in the EU after Brexit because of some other level of voting where remain in the EU won by a land slide. Policy wise they also cannot be compared as even after Brexit the UK will still aim to achieve all environmental targets, recognize climate change and still follow the Paris agreement. To be honest most people in the UK were confused as to what they were voting for and might possibly have voted using a dice. I was just pointing out the irony that the areas that provided at least 21.4% of Trump's votes (just Texas and Florida) have likely been the victim of man made climate change despite his administration refusing to acknowledge its existence. Although proving that it was the cause of such storms is impossible, one can say for certain that the storm would be less severe if there was not on going man made climate change and global warming. I fully understand that a lot of the effected people might believe in climate change and not support the views of the current administration, despite their vote counting towards it. Okay, well, whatever. Think what you will. I'm done with this topic. Collective Godly punishment is just a terrible thought, in several ways. So it wasn't just here they did that. We did however get a few minutes of coverage from Cuba yesterday. And I think there was a small report from St. Martin a few days back, although the images were (mostly) of troops getting ready to depart from Europe. Of course, it is easier for the media over here to provide coverage from Florida since at least the two major television channels have a resident journalist on the continent. Whether it is God or just teachers, or anything in between, I'm used to it by now. I think the representation problem of the voting systems is general. There isn't a direct proportion between voters and representatives in parliaments. That is to say, it isn't true that "one person equals one vote". Some votes weigh much more than others. Why? My opinion is clear here. It's the "countryside vs city" dichotomy. If the voting system were truly representative, as it should be, most governments would be decided by the voters of big cities (who are the majority in the country). Everybody knows that rural vote tends to be conservative. Ergo, the present systems aims towards a conservative (intentional?) bias. After Monday's election, the uneven weighting of votes has been discussed. Or perhaps weighting isn't quite the right word. The primary thing is that it makes a big difference is whether a party gets more or less than 4 percent of the votes. In Norway, members of parliament are elected on a county basis, but since each county elects multiple representatives, it is not a winner-takes-it-all affair like certain English-speaking countries. However, parties may find that they get underrepresented since they only can have an integer number of representatives from each county. Parties having over 4 percent in total therefore get their share of an extra number of representatives so that their final share of seats in parliament gets more closer to their share of the votes nation wide. Although votes in the countryside (strictly the less urbanized counties, which still may have a sizable population in towns/cities) do count more here, the countryside is not particularly conservative. At least if one by conservative means the right (as opposed to left) side of politics. In particular now, since the party called the Conservative Party in English (but Right would be a more litteral translation) is currently upsetting the countryside big-time. Then again, the difference between left and right in Norway is probably rather slim, at least once the rather insignificant fringe parties are excluded. It's the "countryside vs city" dichotomy. If the voting system were truly representative, as it should be, most governments would be decided by the voters of big cities (who are the majority in the country). Everybody knows that rural vote tends to be conservative. Ergo, the present systems aims towards a conservative (intentional?) bias. That would be true if seats in the Parliament were occupied by just a mere proportions of the total of votes in the election. But that's not usually the case. Usually the voters are divided in groups (counties, provinces, etc.). Seats are decided independently in each group. Often the number of seats assigned to a group is proportional to the population of that group, but not always. For instance, imagine one group is CapitalCity with 20 seats and another is CountryTown with only two seats. Parties in the big city receive more or less an accurate representation, but in CountryTown only the bigger parties get their share. Al other votes in CountryTown counts "zero" towards representation in the Parliament. You put it in a ballot, but could have put it in the dustbin as well. The outcome of such systems is that it may happen that the percentage of votes for a party and percentage of seats in Parliament aren't correlated. The winners are usually big, established, pro-system parties. The looser is Democracy, where all persons should contribute equally to the decision of who governs (no matter race, gender, place of residence, etc.). And that isn't the case. That affects specially to minorities. And worse of all, that artificially "shapes" the number of parties in a country, etc. One may argue that you are voting your representative for your group. But that (depending on the country) can also be wrong, since when something is voted in the Parliament, frequently, MPs follow the indications of the party, not to mention that (also in some countries) people vote for the party and doesn't even bother or know who the representative of his group is. Correction: It IS true if seats in the Parliament ARE occupied by just a mere proportions of the total of votes in the election. I already posted a video showing why the voting system in the UK is not ideal and I agree that it leads to misrepresentation. But that's a general flaw of the system that applies to every case of minority vs. majority - it pretty much overrepresents majorities and underrepresents minorities of all kind, especially those not gathered in one place. Hence you either change the system as a whole, or you accept the flaw - but playing around with something like "city vs. countryside" is putting a bandaid on a lost leg. Norway is listed as having proportional representation in that page, but the final result is not proportional to the total of votes in the country. I think most countries in Europe are in a way federations, even if they are not so formally. There are subdivision with a sense of identity stretching back through time, joined together by one or more monarchs centuries ago. If some parts get too much power, even if justified by having the greater population, the country will tear itself apart. In fact, and again depending on the country, there is a certain "country vs city" bias, but I can agree that that can depend upon population distribution in the country and electoral system. Soria -> 90K inhabitants -> 2 seats -> 1 seat for every 45000 people! And that happens in all "country provinces" with less populations and a higher ratio of seats/people. So in "country provinces", there is a huge misrepresentation (more seats with less votes) and few seats. Combine that together and you'll see that a great amount of seats in the Parliament is given to "country provinces" and only for the biggest parties. The electoral system promotes fewer bigger parties and punishes smaller ones (minorities). And it also happens that country people tend to be more conservative (right wing if you like). For me it's clear that that isn't a mere coincidence. Funny thing is: Austria IS a Federation, yet our voting system does not have that problem. In Austria, the Parliament consists of a lower house, Nationalrat, with 183 seats, and the upper house, Bundesrat, with currently 61 seats. The Bundesrat works like you describe - each of the nine federal states gets seats according to population (but at least 3), and those are divided according to the composition of the government of each federal state, which was elected without using any electoral districts- direct transfer of voting numbers to seats. So no vote is for the trash bin, since it still count's for the more important states government, even if it does not affect the Bundesrat. The Bundesrat has very, very limited power, and only really comes into play when the Constitution is about to be changed or if the responsibility of the federal states is about to be changed. So nobody cares anyway, and many would rather get rid of it. The Nationalrat is elected without any electoral districts, same as the president. Each vote is the same, no matter where it comes from, seats are divided according to the percentages. It's also the part that really counts, seeing as it passes federal laws and such. This is what I was referring to, I guess the Wikipedia list also shows countries where that kind of election happens on a different level. Norway does have electoral districts, but at least each district has more than one vote, which already makes it way better than the UK system. Plus, there are spare seats to mitigate the imbalance. It's just that 19 of 169 seats is not enough, but if it were 69 of them, it might even be better than just dividing by percentage, since you should be just as close but can still be sure 100 seats are occupied by "local" politicians. The "country vs city" bias described here is just a result of a really poor attempt to fix a broken system. It's not part of the system itself. You do not set the number of seats in each electoral district at random, there is always some background. Like in Austria, where you change the number of seats in the Bundesrat after each population count, or Norway where it depends on both inhabitants and landmass. In the US, the numbers are set, which is part of the problem. No idea how it works in Spain. If you divide seats strictly by population count, there would not be a countryside bias. The captital with a million inhabitants has 100 seats, some rural region with 50k inhabitants only 5. If you add in landmass, of course, each persons vote might count more or less, and generally speaking, the countryside would benefit. However, you could also say each persons vote also represents the land they inhibit, as if they would vote for the land. You can argue whether that's fair and which relation to apply between the two numbers, but at least it's a clear cut rule. The original problem of the system is the second one - the less seats a region has, the less likely a minor party gets them, the majority wins it all. In a Two-Party-System, if every electoral district only has one seat, you could win with just above 25% of the votes, since you need just above 50%votes in just above 50% districts. In a three-party-system, you could win with 17% - Win Half the districts with 34% of votes. That's unlikely, but shows the issue quite well. And this is were gerrymandering may happen. The silly solution is to give each electoral district a minimum number of seats. No matter how small your district is, how little population it has, it is always granted at least two or three seats. Let's say just two - one seat to the winner, the second to second place unless the winner got twice as many votes as second place. In a two-party-system, you would now need just above 33%, since you could win both seats with just above 66% and need to do so in just above 50% of districts. In a three-party-system, you can win a majority with just above 22%. So, it arguably does become more accurate. But also, you would need twice as many seats in this scenario, nobody's gonna pay for that. Luckily, there are usually large differences in population between different parts of a nation, so just take from the rich and give to the poor. That's what causes a difference in vote value - the attempt to fix one problem creates another. Now here is a silly thing: If you go by numbers (Of Soria and Madrid), Soria gets half a seat. Accuracy would be arguably higher if they don't get a seat as opposed to them getting a seat, and both is better than two seats. How so? If Soria gets the seat, their population only counts for half the seat, plus all but the winner is ignored. So at best, all Sorians vote the same, and the seat is still only half accounted for. However, in Madrid every 3% have their own seat, the accuracy is much higher. So voters of Madrid get somewhat accurately represented in seats, no matter what they vote for, so the seat would always be half accounted for. Actually, if the seat-math of these two works out for all of spain, you would also see why - even if all of Soria would vote the Soria Party, if noone else would, that party would not get a seat by percentages either, since Soria would just be too insignificant. Very nice analysis! As I said, it very much depends of the population distribution of the country. One size doesn't fit all. In the case of Spain, Soria and Madrid are a few km apart, and there's no cultural differences between them. They'd be better off with a direct, proportional method, without provinces. Although, from a practical point of view, such more democratic system could be less suitable to get agreements. Interesting discussions on local democratic voting systems in Europe. Right or wrong - love the debate. Strange no one has mentioned the undemocratic federal EU, were no one gets to vote who is in charge, yet has to obey its rule. Better yet, on both elections, we voted not to join, and still have to follow their rules. (And rumors has it, we're the best to do so.) The United Kingdom will most likely join us in our misery soon. How nice of them to decide to follow our way of doing stuff, after we have decided to follow their way of organizing the railroads. Care to explain that in detail? Seems to me like a populistic claim. A populistic claim that has demonstrated its power to change the world. The part you quoted is probably explained in almost every in-depth article on brexit there is. The part you didn't quote seems to most serious. However, Poe's law might be in effect here.